The nature of mobile homes is such that a porch and steps are a common home addition. This is not a difficult task and the do-it-yourself home owner can do this with just a little bit of wood working knowledge. 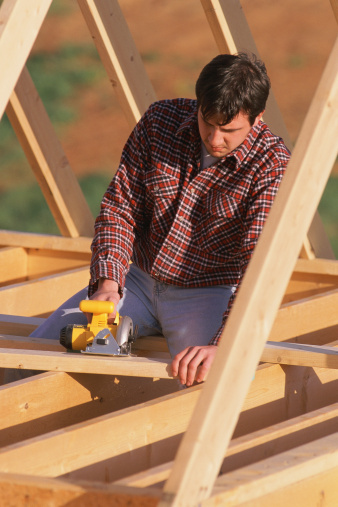 Follow the steps below to know how to build a porch on a mobile home. 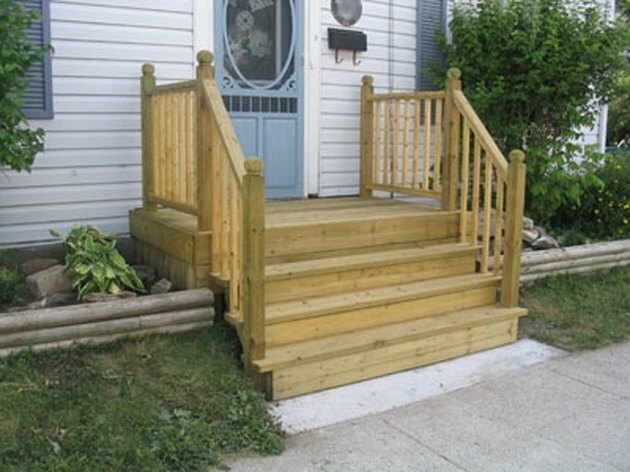 Building mobile home steps is one of the easy home additions. Lay out the 4-by-4 foot area to be the porch with stakes and string. Dig four post holes 24 inches deep for the corners of the porch. Two of these will be adjacent to the mobile home, but not attached to it. All posts will be inside the 2-by-8 floor joists. Set corner posts with concrete. Plumb with a carpenter's level. Let concrete set up. Measure up to the threshold of the door. This will be the starting point for the heavy string which goes around the two posts and returns to the mobile home. This is the height of the porch. Install the (2) four foot 2-by-8s parallel with the mobile home with 4 inch deck screws. Next, install the (5) 45 inch 2-by-8s perpendicular to the four foot pieces just installed. Install the 2-by-4s on the floor joists with the deck screws leaving a little space between them for contraction and expansion. The hand rails are simple frames measuring 4 feet in length and 3 feet in height. Secure these to two sides of the porch with the deck screws. When you build mobile home steps, measure the height from the ground to the top of the porch and divide this number by four. This will give the measurement of the risers. An ideal tread measurement is 11 inches. Layout these dimensions on the 2-by-12 pretreated lumber. These will be the stair stringers. This porch step is four feet in length and will require three stringers. Cut 8 stair treads (the part the foot uses) from the 5/4 inch material to secure to the stringers. The tread should hang over the stringer at least one inch in the front and the edges. Attach a length of the 2-by-12 at the top and back of the stringer with the deck screws. This will allow the stringer to be attached to the porch. Secure the stringer to the porch with the deck screws.